Because this is the adventure capital of New Zealand, Outdoor Shops in Queenstown are not hard to find. For the perfect windcheater, trendiest wellies, most luxurious tent, or just a nice brolly, you'll have no problem finding what you want. 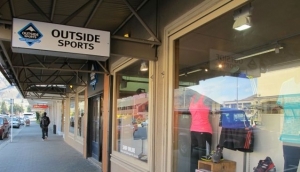 Queenstown Outdoor Shops are found mainly around the CBD streets. Shotover Street and Beach Street have several clothing and equipment places, including a three-level outdoor equipment centre, which will stock whatever you're after. Skis, snowboards, bikes, and all the clothing you'll need to go with it, are just steps away. Remarkables Park Shopping Centre has a couple of very good outdoor outlets. For something a little individual, to make you stand out from the crowd, the CBD has some boutique, independent outdoor stores, which also do some good clothing deals. Because everything in Queenstown is pretty much walkable, it's worth really shopping around for what you want, because prices tend to vary quite wildly. If you're here in low season, there are some great deals to be had on the bigger brand names, as stores think about changing their stock, ready for peak season.